Sprint booklet makers have long been referred to as the top in the industry. When paired with the optional trimmer and combined with collators it is a complete document finishing system. 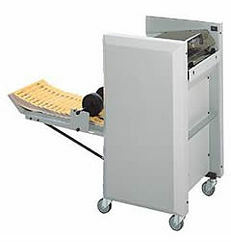 The Sprint 5000 booklet maker produces a wide variety of booklets quickly and easily. The Sprint 5000 jogs, staples, and folds in only one operation. The quick and easy set-up makes adjustments from one booklet to another very stress-free. The heavy-duty staple clincher produces an accurate “flat finish” staple and a crisp and professional looking booklet. The Sprint 5000 has the capacity to staple and fold booklets up to 22 sheets of 20 pound paper and 5-1/2″ x 8″ to 11-1/2″ x 17-1/2″. The Sprint 5000 is capable of variable speeds and producing booklets up to 88 pages thick. You will never loose time again with the 5000 staple cartridge because of the automatic stop and signal light when out of staples. The built in powered conveyor stacks booklets neatly and folds away for space saving storage. The Sprint 5000 functions as a handfed system or in-line with MBM FC10 collators. This machine has heavy-duty casters for easy mobility and the transparent safety access covers will not allow the machine to operate what its open for optimal safety. The Sprint 5000 comes with 2 stapling heads, 5 stapling positions and 5,000 staple cartridges and an optional face trimmer is available for purchase if you need a way to trim your documents after they have been stapled. The Sprint 5000 is an ideal when you need to create a lot of booklets in very little time because it has the ability to produce as many as 1,500 booklets an hour, which is equivalent to 25 booklets a minute. This machine is great for high end, large volume booklet production. If you have any questions or are interested in purchasing the Sprint 5000 Booklet Maker, visit us at SpiralBinding.com. We have great pricing on a full line of Booklet Maker Systems. Call us at 1-800-631-3572 for more information!